You use the Maps app on your iPhone everywhere you go. So why not have a map when you really need it, at the airport? Airport Maps for iPhone and iPod Touch gives you just that. With coverage for 61 major North American airports, Airport Maps gives you what you need to quickly find your gate, a place to eat or shop and your favorite airline lounge. Airport Maps’ detailed gate maps allow you to see where you need to go in an instant using familiar pinch to zoom and scrolling technology. Airport Maps works with or without a data connection, so you can find your connecting gate (and if there’s a Cinnabon on the way) while you are still in the air. Airport Maps Is Now Available In The Android Marketplace! Scroll through the list to the airport map you want to view or hit the 'Closest' button to use your device's location feature to be sent straight to the airport map nearest to you. 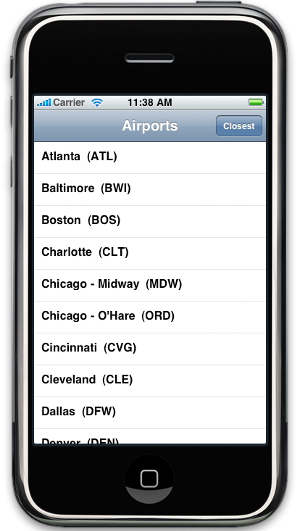 Use familiar pinch to zoom and scrolling features to browse the airport map. Tap on a specific terminal to be sent to a detailed view. Go to the services view to see a list of dining, shopping and lounge options divided up by terminal. Tap on any service to be sent to its location on the map. The lounges view let's you find your airline's lounge quickly. Just tap on any lounge to be shown its location on the map. Detailed terminal maps show you exactly where your gate is located as well as your shopping and dining options. Hide any category of services you aren't interested in to make the map less cluttered. Tap any icon on the map to get more information. Copyright © 2009 Michael Wolff.